For the purposes of this story my face has been pixelated and my voice modulated. You see, I am about to espouse civil disobedience. Roll up, roll up! Its clearance time again: appliances, toys, building supplies, glassware, furniture and more. The January hard garbage collection has commenced in my municipality. This twice yearly event, allows households to dispose of 6 cubic metres of waste per annum. By my rough calculation, our 59,000 households could fill 142 Olympic swimming pools. That's a lot of rubbish. Of course the reality is that the waste contractor will mulch, scrap and recycle parts of the refuse. I am sure that they will even make a little something on the side by on-selling things like metal. But what about that perfectly good lamp shape that's been put out down the street? Or the nice little plastic kiddy car and basketball ring around the corner? They have landfill stamped all over them. And no matter how good they are, no one is supposed to rescue them. Its an offense; breaking of council by-law. The council even have a dob-in-a-rummager hotline. This kind of nonsense can only lead to lift-and-shift subterfuge. Personally I'd recommend going out at dawn or dusk. Wear a backpack. Or a trench coat with deep pockets. Maybe go walking with an empty pram. Or bring a van in the dead of night. If you'd like to be really safe, protect your identity by wearing ladies' pantyhose over your head (though not the ones you found in the hard garbage, because they probably belonged to Gladys down the street and she's a bit incontinent). And remember: move on quickly if you see lace curtains moving or a porch light switch on. You don't want to be hearing back away from vintage Tupperware and put your hands in the air. You know around here they just load them on the truck and crush them before your eyes! Made me go teary! can't believe you can't do that though, crazy rules!! and a hotline!?? people throw out so much stuff that is perfectly fine or would be with a little DIY, that its stupid not letting people rummage for it. My council encourages rummagers! As long as you don't make a big mess. I love it, watching people go through my junk and it's community bonding in action. I wave and strike up conversation with completely random people. What a load of rubbish, heehee. It's so stupid, really when we are meant to be doing everything we can to recylce and reduce the amount we throw out. Get out those pantyhose I say. I can really count on you to make me laugh till I leek pee and tears at the same time. You rock my cotton socks! I love hard rubbish time! Every year new treasures, and if they don't work out you recycle them next year for someone else to love for 12 months. My best find last year was an Elnapress, which I've used for quite a bit of fusing. Carrying it home was a test of endurance, though. I might have to head over your way for a rummage. 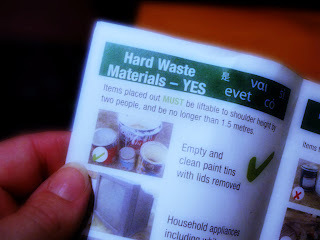 We have to book our hard rubbish collection now, and it's collected on a pre-determined date. I had an appointment booked last Wednesday, and so I had everything dragged out into the driveway on Tuesday and placed the big red sticker on it. Tuesday night there was a knock at the door by a lovely indian gentleman asking if he could take the chest of drawers and the bookshelf. I'm very glad that someone could use them rather than ending up in landfill. Dob in a Rummager hot line!? Silly Bastards! Lets organise a huge group of 'practical minded rummaging outlaws' and we will take a stand! Let me know when!!!!! Argh! That ancient by-law makes my blood boil. Luckily the general feeling around here of neighbourhood comraderie in the face of wasted upcycling and pointless landfill means that everyone is looking the other way as you pick up that lampshade. No need to try and squeeze it under your tee and waddle home! I didn't realise that it was an offence to rummage, that is crazy!! Council clean ups are the best forms of recycling - often there is nothing left for the council to collect because it's all gone to new homes! oh oh what did you pick up? It's absolute madness isn't it. Our youngest proudly rides the tricycle (with parent-handle attached) that we got from hard rubbish last year and I like nothing better than seeing our old and slightly wonky deck chairs being used by the students in the house down the road. Recycle and reuse I say, even if it has to be done in the wee hours of the morning. I love a good rummage myself, but I don;t like my the nature-strip strewn with refuse (if you don't want the stuff in the old trunk, or the trunk, put it back in there perhaps?) I'm still amazed that our terrible old stove vanished in 3 hours.